Wow! What an amazing day it was in Halifax Sunday. I’d like to do a short recap of my day and what made the Bluenose 2013 with team Love4Gambia such an amazing experience. But before I begin with my details, I would like to give a quick shout out to the race organizers, the volunteers, and the community who all came together to put this event together and make it the wonderful experience that it was. So, thank you! 5:00 – Wake up, shower, make coffee and breakfast, pack bags, get dressed, double and triple check everything. Take deep breaths. It’s looking like it’s going to be a beautiful day to run outside. Try to remain calm and save the adrenaline for the kilometers to come. 6:00 – Wake up Steve. Jump on the bed yelling “It’s your first 10km race today! You’re going to run 10km! Time to get up! Time to get ready! Aren’t you stoked!” Only to get the following response: “Why are you so chipper; You’re more excited that a kid before Christmas”. 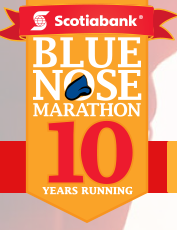 Well, of course I am…it’s THE MORNING OF THE BLUENOSE!!! 7:00 – Get bikes and pedal to the race start. Luckily, clean NS was even providing VIP valet bike parking services to park bikes in front of city hall – they even fixed up my brakes a bit while I was running :). Take a last pre-race pee, do the nervous/happy dance to loosen up/question why I signed up for this race again/ the usual pre-marathon nonsense. 8:00 – Race start! Woohoo, a bit sore from tree planting earlier this week and biking yesterday, but overall I feel well rested mentally and know that this time I have done the training to prepare me for the long run ahead of me. After a few km’s of going a bit fast, I settle in on the pace I talked about with my coach, about 5-5:10 per kilometer – a bit slower on the uphills, and a bit faster on the downhills. Nice and calm. 9:00 – The kilometers are going by surprisingly fast and I still feel good. The course is a lot hillier then I remember, but there are so many people out to cheer it is hard to be too negative about anything. I think this part (Shubie Park) is my favorite part of the marathon- for a few minutes I cannot see anyone ahead or behind me and can just relax and feel like I am on a long practice run. It gives me a sense of calm and time to just run before returning to the crowds on the streets. 10:00 – Run up Maple road hill, that’s right, I actually managed to run up the whole thing. During the marathon last year, I remember walking up the never-ending hill, with people yelling at me, “you can do it” and “stay strong”, but this year heard “you’re killing it” and “looking strong”. Definitely had the training behind me and felt a lot better throughout this section of the run, and that hill wasn’t nearly as bad as I remember it. In this way, the marathon this year was a great confidence booster that really helped to show me how the training is paying off and just how much my running has improved throughout the past six months. 11:00 – alright, this is where it gets tough, 36km, about 6 kilometers to go, and at this point I was feeling it in my joints. And the course definitely stays tough throughout this part, including the hills of Point Pleasant Park followed by the gradual uphill up South Park road. A fellow marathoner (Kirk?) caught up to me around km 41 and shouted, “you’re effing fast – I’ve been trying to catch you this entire race, let’s finish this together”. It was really just the push I think we both needed. With this we got through the last 2km together to finish strong. 11:42 – The finish! 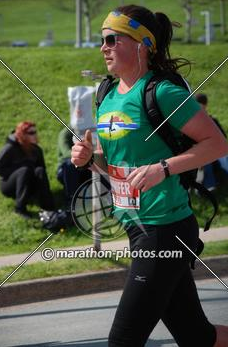 It is hard to explain the emotion that comes with finishing any marathon. So many people help to get you through the 42km and it all comes together for that final moment. It’s pretty spectacular, and I’ll leave it at that. 12:00 – So stiff – attempt to stretch and talk about the run; mostly try not to think about how much every joint hurts. Attempt to bike back home (mostly me walking my bike at a very slow rate, stopping to ‘stretch’/lay down in various grass patches along the way). 2:00-4:30 – Recover- shower (very painful with the random chaffing marks acquired during the run. I kept jumping around yelling when the water would hit a different spot, washing the salt from my accumulated sweat into the sore – this might be the worse part I foresee about running in The Gambia), followed by eat, rest, eat, rest, and enjoying the feeling of accomplishment that comes with completing a tough marathon. 5:00 – Team Love4Gambia supper at the Armview. This was one of my favorite parts of the day. Because I started at 8:00am and finished around 11:30, I started before most people arrived and finished after everyone had left. This post-run celebration was a great medium to catch up with other runners and to do the runner talk about times, how you felt during the run, and of course, how you could have “pushed just a little bit faster”. Everyone on team Love4Gambia did an amazing job; many people completed a new distance for the first time, and many people helped to fundraise for the health education programs for youth in The Gambia. In summary, it was a pretty epic, wonderful, awesome, and “Christmas-like” day in Halifax to be a runner! It really goes to show that it is the more simple things in life that count: running, community, being outside, and so forth. What really made this experience different for me from last year (besides the training) was being apart of team Love4Gambia. This was an amazing group of over 60 people that participated in events ranging from the youth run all the way to the marathon. It was great to see the green team t-shirts throughout the day and just to yell “go Gambia” and get a positive response in return. This also gave me a lot of purpose in my run; I believe running can be used to accomplish great things, as an individual and as a community. I believe this was exemplified through the Bluenose yesterday and the sense of community and pride it sparked throughout Halifax and Dartmouth. So many people pushed their individual limits to run new race or run faster times, and the community pushed it’s limits by organizing the largest event to date with over 14,000 participants! This is also what I hope to do with my run across the Gambia, (on a smaller scale of course). Yes, it is an individual run, and I will challenge myself physically and mentally on an individual level to overcomes the challenges that come with running across a country. At the same time, I hope this run will bring communities in The Gambia and Canada closer together through the universal sport of running. 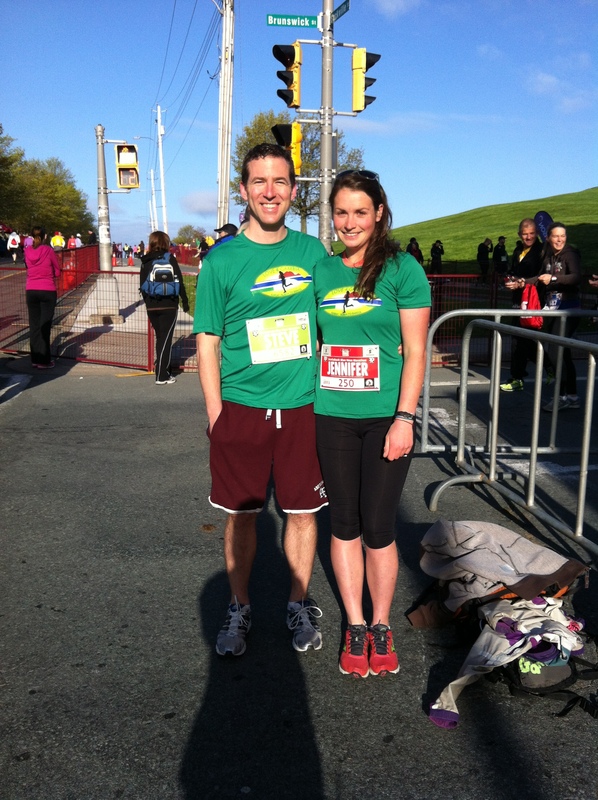 We ran as a team in support of the NSGA this past weekend here in Halifax, and I will be running with children in The Gambia who are the recipients of the NSGA’s life-saving programs. Please support me (Click the donate button on right and select love4gambia), as I use running as a means to connect Nova Scotia and The Gambia in order to promote health in both location. Also, check out Love4Gambia on the CBC! Tv link (love4gambia is about 9 minutes into the show) and the newspaper article. This entry was posted in Blue Nose Marathon. Bookmark the permalink. Also, I forgot to add the most important part! Unofficial numbers from May 13, 2013: Team love4gambia consisted of 60 people and together we raised $9, 497 for health education programs in The Gambia! Great Work!